In the night the skies were clear and the moon was fat, and when I awoke the light through the windows was so bright that for a moment I thought I’d overslept. I slipped down the stairs for a pee, close enough to the cows that I could hear their exhales, watch the rise and fall of their long ribcages. Those big, big lungs. I could picture the mottled pinkness of them, could almost feel the rubbery warmth of them in my hands. Heavier than you’d think. I thought to stand for a moment longer than my business necessitated, but it was zero or maybe less, so once relieved I made fast for the nest of our bed. I slept soundly in that strange milky light, dreaming of nothing (or nothing I remember), and when I rose again, the moon was faint in the sky. Full moon had the same effect on me this morning, and my wife and I commented on the neat designs in the ice on the glass too. Coincidences! SO poignant; simple beauty that constantly surrounds us savored and shared. How sad such beauty so often goes begging for its very existence. Great lesson Ben. THANKS! That Wolf Moon must have been breathing on your windows. Beautiful photo! Oh, I remember those winter days (and nights) making the trip to the outhouse. I used to grab one of the cats that wandered over to put on my exposed thighs – win/win for both of us! Ha! 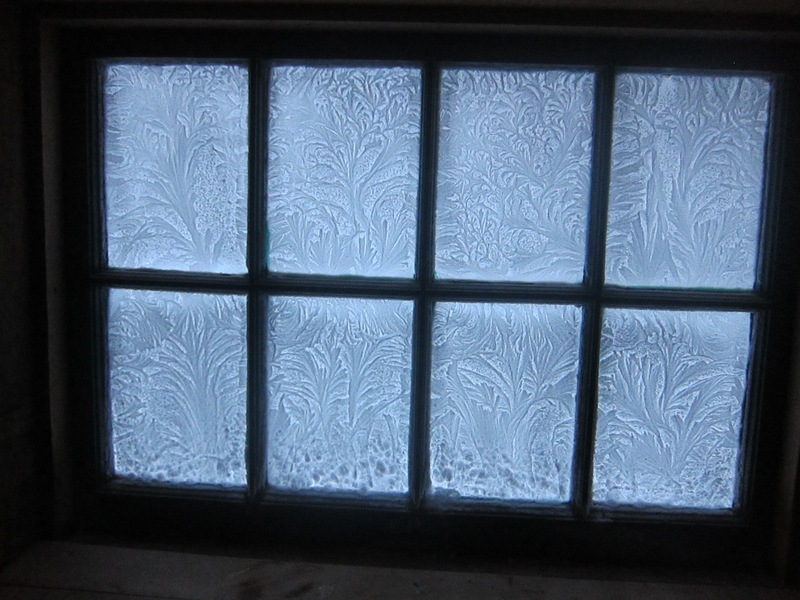 Love the ice ferns on the window and the picture you paint of your moonlight wander. Our old farmhouse got, thankfully, a second floor bathroom when we renovated. It has one of those slanty windows that’s not uncommon in old farmhouses when there wasn’t enough room to put a second floor window in the space between the roof and the lower roof of the kitchen ell so it is installed tipped to the side. This early morning the moon is shining in that window, my economical nightlight. This might depend on how good looking you are. We went for a couple of midnight hikes under that moon, it was a amazingly bright, even in the forest. That was a nice treat….and I saved the picture cuz it’s pretty! Your writing is a deep blessing. Really, it’s your heart. Hi Ben, you don’t me and I don’t know you which makes me feel uneasy sharing my opinion with you. But it is the E-age, so here goes. I love your blog. It’s my favorite E-read on my phone. I share your stories and philosophies with my high school leadership classes. I subscribed to The Sun because of you. In other words, thank you. So don’t take this personally. But I think you danced around the topic of hope. Whatever, dancing is a good thing. But don’t discount the power of hope. It’s just a word, but more importantly, it’s a mindset that allows you to believe that things can be different. Considering the age group I teach and try to inspire, it’s critical that they believe they can make a difference in our/their world. Hope is powerful. Dance with it not around it. Thank you for all you do. I agree with what you say, Jim.